Yesterday, the BiblePlaces newsletter went out with a big announcement about our newest Photo Companion. If you did not receive the newsletter (or if you did not take a moment to read it yet), you can check it out here. 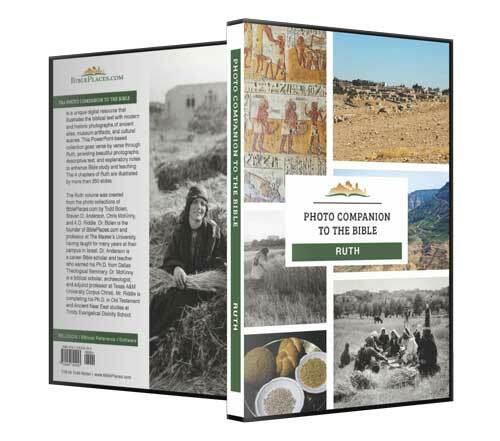 The Photo Companion to the Bible launched last year with the release of The Gospels. Now, we are pleased to announce the latest volume in the series, the book of Ruth. Ruth is chock-full of cultural and geographic scenes which the BiblePlaces team has illustrated with 350 modern and historic photographs. The photographs are arranged chapter-by-chapter and verse-by-verse in PowerPoint files, accompanied by descriptions, notes, Bible citations, and labels. Whether you are a student, a teacher, a pastor, or a lay person who studies the Bible, we believe you will truly appreciate this carefully selected assortment of photographs. To mark the release of this new volume, Ruth is on sale this week for only $20. The price includes free shipping (in the U.S.) and immediate download. Visit this page for further details and to order. esellerate via email or through this website doesn't work. Can't purchase Ruth. Shabbat is approaching, so I guess I'll purchase later at the higher price. Shabbat Shalom Ya'll. Hi Mike - I'm not sure why it's not working. From what I see here, things look in order. But please contact me later to receive the reduced price. Shabbat shalom.